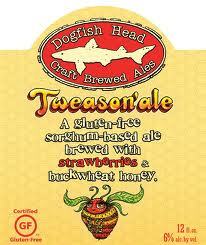 Dogfish Head Brewery, a Delaware-based brewing company, will release a new Gluten-Free beer, Tweason’ale, in late January 2012. The brewery’s new fruit-forward beer with 6% ABV will be released four times a year. Dogfish Head said the classic barley foundation of beer has been replaced with a mild sorghum base. The beer contains hints of molasses and pit fruit, balanced by strawberry notes and a complexity that comes with addition of a malty buckwheat honey. According to Dogfish Head, the beer consumers request for a gluten-free beer often at its pub, brewery and website.